A GROUP of dedicated volunteers gave up their New Year’s Day to help clean up the town centre. Members of the Ahmadiyya Muslim Youth Association (AMYA) braved the wind and rain to help in the tidy up. The Bolton branch of the charitable organisation hit the streets around Nelson Square, Deansgate and Bradshawgate. Members aged from 40 to just eight-years-old helped Bolton Council officers collect up to 20 bags of rubbish. Ahmad Salman Arshad, leader of AMYA Bolton, said: “We work with anybody, many of the dads have been with us for several years and they brought their children out. The young lads were really interested in the experience, they treated it like an adventure, coming out early in the morning. “The streets were very quiet, some people were just leaving the pubs and all the shops were closed. “It was really windy and wet weather and I was worried about the young lads but they enjoyed it. “Everyone came out on their own wish and really enjoyed it. Mr Arshad, aged 35, organised the litter pick with the help of council environmental enforcement manager Andy Bolan. Fifteen volunteers took part following morning prayers and were supplied with brooms and bin bags by the council. The Big Street Clean campaign is in its second year and is one of the charitable and community initiatives carried out by the AMYA across the winter break. Mr Ashad added: “Our members have enjoyed living in Bolton for decades and so any opportunity to help our local community is much welcome. “Cleaning the streets also presents us with an opportunity to become better Muslims as cleanliness is an integral part of our faith. “We are a peace loving British Muslims and will continue to do all we can to serve our local community as best we can and wherever there is a need. The group also organised blood donation sessions, charity collections, Children’s hospital and Nursing home visits, and homeless feeding sessions. Volunteers also took to Moss Bank Park on December 17 for a litter pick session. Mr Arshad, a support staff member at Bolton Council UCAN centre, explained: “All our volunteers are young professionals, some are studying at university while others have jobs, and when they have got extra time they give up their hours to serve the community in different ways. “We do lots of work ourselves including collections for organisations like MacMillan Cancer Support, the British Royal Legion and Marie Currie – we do charity work all year round. The Bolton branch of AMYA was founded four years ago and covers Bolton, Bury and Wigan areas. It is part of the Ahmadiyya Muslim Community, which has more than 8,600 members spread across 124 branches in the UK. In the coming year Bolton AMYA members will be taking part in a number of projects including planting trees for the Woodland Trust. 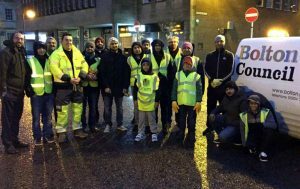 Share the post "Volunteers from the Ahmadiyya Muslim Youth Association take part in big Bolton town centre clean on New Year’s Day"